Alien: Isolation is a breath of fresh air among the video games that nowadays depend on more gore and grotesque creatures to up the shock and horror. If you want grotesque creature designs, go for the Resident Evil artbooks. This game is designed more towards Ridley Scott's Alien which uses the-less-you-see-the-more-frightening-it-is concept. It works very well in the movie, in this game and even in this artbook. 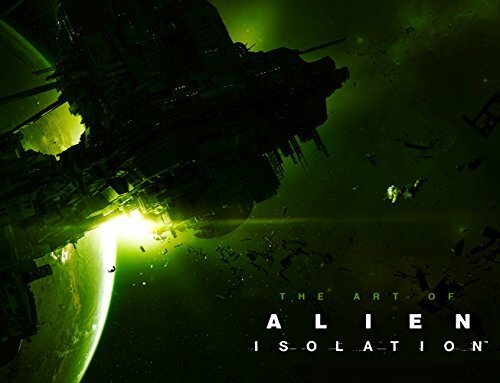 If you don't already know, there's only one alien in the game, which means in this artbook, the bulk of the concept art on the characters, weapons, spaceships, interior design and environment. I love the style of the character designs. They are drawn in anime style with thin outlines and simple shading but are based on real human proportions of course. There are lots of character designs and iterations. The cool part for me are the 3D models based off the crew from the original Alien movie. It's really nostalgic. Not only that, it's quite amazing to see them back. The spaceship designs are really beautiful. The high resolution 3D renders are just gorgeous to look at. There are the textured versions as well as simple grey monotone renders. The details are amazing. There are a few ships and they are rendered from different angles, some with the blueprints provided. What's weird though is there are wireframes for Nostromo but it's not actually rendered. The same level of intricate detail is used for Sevastopol space station and all the interiors. By the way, the designs are all inspired by the original Alien movie. Creative Assembly managed to get the production art from the movie studio and expanded on the source materials to include new locations, equipment, costumes and the characters. The result is a coherent design that's consistent with the original movie. It's really well executed. The environment art are beautiful. For some reason, it does feel scary looking at them, especially when they are empty and devoid of people. You can almost feel the stillness. And finally, spoiler alert, the alien Xenomorph reveals itself. The concept art pencil sketches are marvelous and the alien looks great. There's also art for the alien hive. The last few pages are the storyboards. Throughout the book, there's a generous amount of commentary alongside all the artworks that really give insight to what the designers are trying to achieve. Overall, the art direction is brilliant. To say that about this game is to say the same for the original movie. The game really nailed the mood and vibe of the movie. This is an excellent video game artbook and companion to the game. Highly recommended to the fans. Those who love mechanical or sci-fi architecture would also love the book.